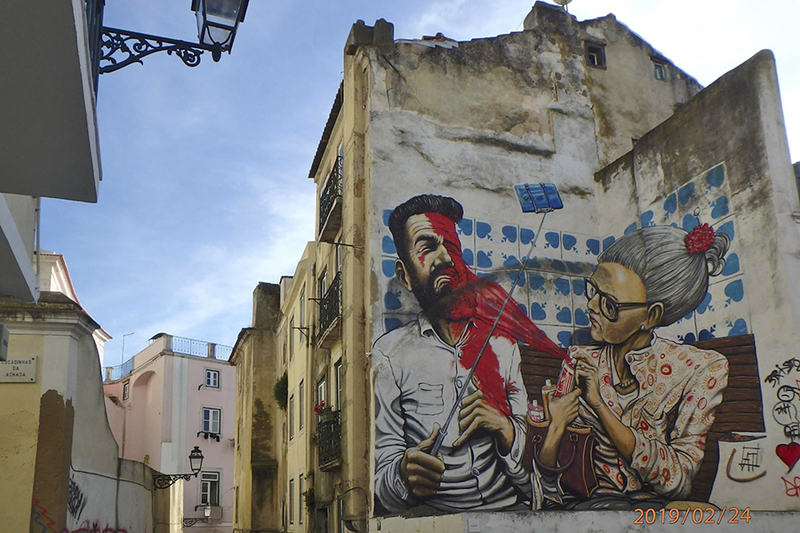 In the essay below, Nicole Abrate Echezarreta ’20 discusses the ways in which the History and Culture Academic Travel trip to Lisbon, Portugal, in early March vastly exceeded her expectations. I never really let a thought about Lisbon or Portugal slip across my mind throughout my 16 years of life. I never wondered, nor was interested in it. I just knew its existence and remained untouched by it. Never including Lisbon whenever a vacation was planned. Never caring about the secrets and wonders it has and hides. Therefore, when I signed up to go to Lisbon for Spring Academic Travel, pure and genuine excitement did not fill my veins. However, I was never discouraged by the thought of Lisbon, it just happened that we had to meet, and I am so grateful that we did. When I first arrived, the atmosphere was warm, not just because of the heat but also because of the people laughing and talking, because of all the musicians framing every corner of the city, and because of the architecture that surrounded us with colorful visuals that would not stop intriguing us. It was an unexpected surprise that turned the sides of my mouth upwards in a never-ending smile. The first day we spent looking around the city guided by a local guide who introduced us to the most delicious pastry that I have ever tasted: el Pastel de Nata. We later saw the sunset in the main square while musicians were playing music and strangers were dancing to the beat of the sound mixed with their heartbeat. It felt like the break that I much needed. Walking and exploring the little bits of the city while laughing and joking with friends let my heart feel lighter and lighter. I could not stop believing how endearing Lisbon is, how every house and street tells a story. How this city suffered so much from the earthquake in 1755 and rebuilt itself with such a positive outlook. On the next days of the trip, we visited castles, aquariums, and museums, walking kilometers and kilometers. We walked so much one day that when I laid down my feet felt like they wanted to fly away from my body in order to rest. As we explored we got to know the city’s gastronomic side, and I have never been more pleased by how many surprising layers there are to a city. We went to many different restaurants and always left satisfied. That satisfaction made us even more delighted to continue this adventure. I must say I never understood people who say that they do not enjoy surprises, and I think I never will. There is something in Lisbon that left me wanting more, wanting to meet her again, wanting to say “until next time” rather than “goodbye.” It made me understand that sometimes things are better when you are completely in the dark, when you least expect them, when there are no plans to spoil your hopes and fantasies, and when there is only you and a city and you are both curious about each other. It taught me that the unexpected can reveal itself in so many different shades that it can color your perspective. It taught me to doubt myself and give a seat to other opinions, to never stop wondering. TASIS pioneered the concept of Academic Travel in 1956. Our students have been exploring Europe and beyond ever since.